This continues my analysis of a draft of a revision to Society of Professional Journalists Code of Ethics. I commented Friday on the changes to the “Seek Truth” section of the code. Here I’ll address the next three sections: Minimize Harm, Act Independently and Be Accountable. I remain disappointed in the revisions and hopeful that SPJ members will insist on a more thorough update. My primary criticisms from Friday’s post still stand: The Ethics Committee went into this process with most members having already decided that the current Code of Ethics, adopted in 1996, just needed a little tweaking. I argued in 2010 and on various occasions since that the code needs an overhaul. I don’t know if we’re in a majority of journalists, but lots of people have told me privately that they agree (a poll on that 2010 post showed a vote of 138-22 in favor of updating, but I’m under no illusion that my blog readers are a cross-section of journalists. I struggled to come up with a name for my blog and I’ve changed it several times. But I’ll keep this one for at least a month. When I left Cedar Rapids, I sort of needed to get “Gaz” out of the name, so it became “Pursuing the Complete Community Connection,” a nod to my vision for transforming news organizations but a cumbersome title for a blog. With the 2010 launch of TBD, I decided on “The Buttry Diary,” working my name into the title as well as the initials of my new organization. Well, Allbritton Communications decided to kill TBD in the cradle, but I kept the name. After all, my name hadn’t changed. And I thought most people wouldn’t notice the initials. And, if they did, I was happy to honor a great news team and a vision that, I’m certain, would have succeeded if we had been given a chance. Well, people with my surname don’t make it through junior high without a thick skin. I was Butthead before anyone thought of Beavis. And I was Buttface and Assbush and any number to plays on the part of my name that reminds people of their rear ends. I played along. In my fantasy baseball days, my team was the Kissmy Buttrys (league champions two out of four years before I decided to take my money and run). Posterior plays on my name are so easy to make that few have thought of playing on the dairy sound to my name. So I decided to turn Gene’s suggestion into a challenge: If people would donate $500 or more to the American Copy Editors Society Education Fund, which provides scholarships for editing students, I would change the name one month for every $1,000 raised. Want to rename my blog? It’s gonna cost you! For the right price (donated to a worthy cause), I will rename my blog. We need to overwhelm @stevebuttry with entreaties to REALLY change the blog to “Mmm. 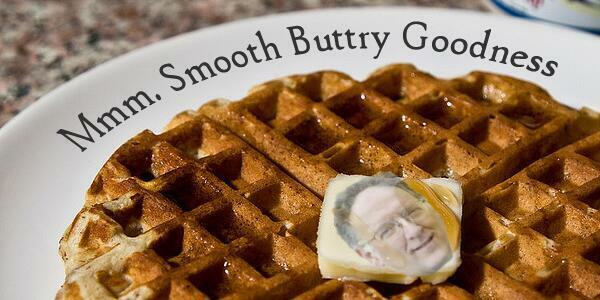 Smooth, Buttry Goodness.” It’s way butter. Er, better.
.@geneweingarten I’m a longtime editor used to rebuffing “entreaties.” Kickstarter campaign? I’ve started a Crowdrise campaign to change the name of my blog to “Mmm. Smooth Buttry Goodness.” (In reading the rules, I learned that Kickstarter isn’t for fundraising for causes.) Update: When I first posted this, I didn’t yet have the fund’s taxpayer ID number, so the campaign wasn’t live yet. It is live now. Grab your credit card and donate. I’ll change the name for one full month for every $1,000 raised with a starting threshold of $500. If we raise at least $500 in the next week, I’ll change the name for a month. If we raise one dollar more than $1,000, then I change for two months. If you give $2,001 I change the title for three months, etc. And, if I can’t even raise $500 to change the name of my blog, that might be a little humbling. And that would probably be OK with Gene, too. Awwww yeah. Slow-jamming the Buttry blog. RT @geneweingarten: . @stevebuttry should re-name his blog: "Mmm. Smooth Buttry Goodness." Oh boy. 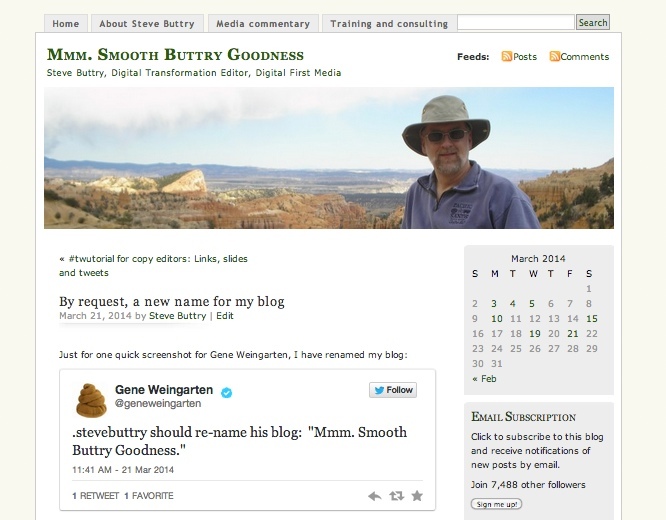 @stevebuttry renamed his blog to something hilarious. @stevebuttry When the email alert came in I was like "WHAT IS THIS?!" We need to overwhelm @stevebuttry with entreaties to REALLY change the blog to "Mmm. Smooth, Buttry Goodness." It's way butter. Er, better. I led a workshop Wednesday on presentation skills for board members of the American Copy Editors Society. Many of the workshop’s tips are reflected in my 2010 post on preparing and delivering workshops and presentations.